We are well into the steamy hot days of summer, although to many of you New England heat doesn't qualify. My cooking approach changes during these weeks and much is centered around main course salads. I use the handmade pottery I blogged about Saturday extensively during this season. The menu is a little more informal and so to are the dishes. I have been thinking about sharing another recipe of mine. It has been awhile since I have, and although this is not a foodie blog, it is a living creatively blog. Those of us that are DIYer's in one, area often extend that creativity to others. This is a recipe I created for summer time. 1/4-1/2 cup chopped fresh cilantro. Reserve 2 Tbs for garnish. Mix McKormicks marinade mix according to directions using 1/4 cup olive oil, 1/4 cup water and 2 TBS balsamic vinegar. Marinate chicken breasts in mixture for about 30 minutes. Preheat grill and grill chicken breasts. This can be done in advance for a cold salad or served warm on top of the other ingredients. Meanwhile cook pasta according to directions, drain and rinse with cold water. To the cooked pasta add the black beans, corn, red and green pepper onions and cilantro, reserving some of the cilantro for garnish. Mix the dressing by combining the Mrs. Dashes Chipotle Marinade with the fat free sour cream and taco seasonings. Add to the pasta mixture and toss well. 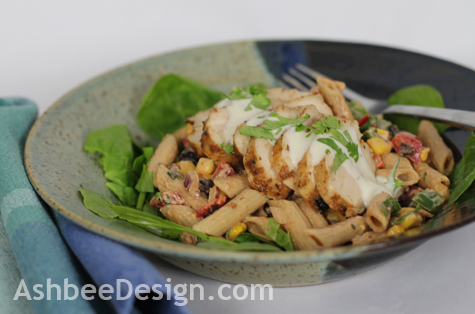 To serve, place a layer of chopped baby spinach in the bottom of a pasta bowl, add a serving of the pasta salad, a chicken breast sliced thinly, a drizzle of Ranch dressing and a sprinkle of chopped cilantro. Delicious with Corn on the Cob! Thanks for sharing this recipe...it looks and sounds so yummy. It is yummy and a great summer salad- which probably doesn't help in your neck of the woods this week! Love this! Thanks for sharing! We would love to have you link up over at our party! This recipe looks really good!! Thanks for sharing it at Romance on a dime. I'm pinning this. Hi! I found you at Not Just a Housewife. I'm loving this salad - can't wait to try it! Thank you for sharing! It's agood one. And mine is all gone. Time to make it again. Report back after you try it.